In order to truly understand vehicle emissions in a location and to ensure that vehicles are performing in actual use as they are supposed to, it is necessary to measure the emissions from vehicles. There are three approaches available today to measure vehicle emissions. The first approach involves bringing vehicles into a laboratory, placing the vehicles on a dynamometer, and measuring their emissions as they are operated. The second approach is to place emission measurement and exhaust flow measurement equipment onto the vehicles and measure emissions from the vehicles as they are operated in the field. The third option is to use remote sensing to detect emissions from vehicles as they drive by. Each of these approaches will be discussed in subsequent sections. However, before discussing the actual measurement process, it is useful to discuss the sampling process. The measurement approach to be followed depends, of course, on the purpose the data is intended to be used for. 1. Testing of an individual vehicle to determine if it meets minimum standards. 2. Testing of a vehicle model to determine if it meets regulatory standards. 3. Testing of a fleet of vehicles to determine the emission rate for the fleet. 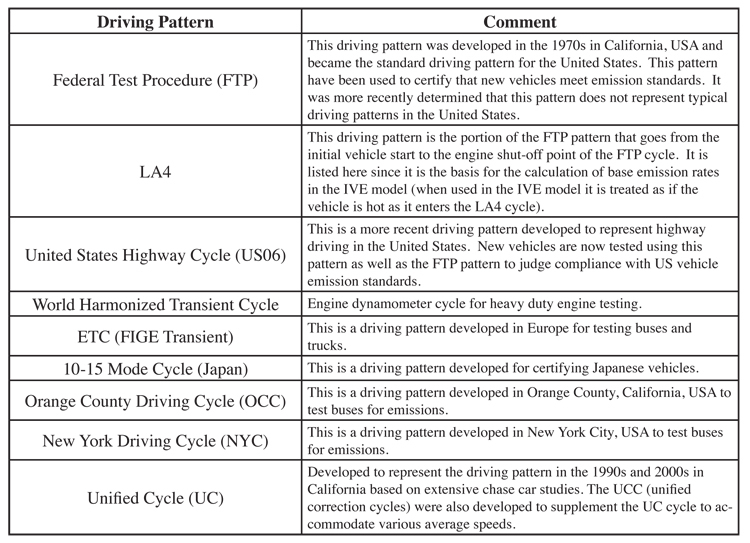 The cases where individual vehicles are tested to see if they meet minimum emission standards is typically the case for government type programs to test vehicles and to determine if they need to be repaired. These programs are often referred to as Inspection and Maintenance programs or I/M programs. The measurement aspects of an I/M program are discussed later in this section. The regulatory aspects are discussed in Chapter 8. The cases where vehicle models are tested to determine if they meet regulatory requirements can be carried out either by vehicle manufacturers or by government auditors. The types of enforcement inspections are discussed in Chapter 8. As noted earlier in Section 6.2.2, the way a vehicle operates can have a major impact on its emissions. Emission limits for vehicles are typically set for vehicles based on specific driving patterns. In order for a test to determine compliance, the testing must be carried out using a driving pattern consistent with that specified in the emissions standard. In some cases, emissions standards for more than one driving pattern have been established for a particular vehicle. If the vehicle fails the standards, under any of the specified limitations, then the vehicle is considered to not meet the regulatory requirements. Clearly, there is a great deal of cost involved to the manufacturer if a vehicle fails an audit. Thus, audits can become highly disputed. For this reason, almost all audits are carried out in laboratories on dynamometers where all relevant conditions can be maintained. This still does not resolve all potential issues, however. Since a test driver cannot normally maintain a specified driving pattern exactly, care must be taken to ensure that the test driver stays within specified limits. The question then arises as to how much in excess of emission standards must a vehicle be in order to declare that it is clearly in violation. This is difficult to define in a general way, but most instruments today that have been properly calibrated, can measure emissions to better than 5%. However, this accuracy must be mixed with the ability of the test driver to meet the required driving cycle. Thus, most vehicles are allowed a small margin of error before they are declared to violate a specified standard. A final confounding point is that once vehicles are taken into the field, vehicle maintenance procedures can impact the emissions associated with the vehicles. It is typically expected by the regulations that a vehicle undergoing normal maintenance and age degradation should still meet the specified emission rates up to a specified usage (often 160,000 or more kilometers in the U.S.). However, it is difficult to determine if high vehicle emissions are caused by “unusual maintenance procedures.” This can only be established by carrying out tests on multiple similar randomly selected vehicles. It is not unusual for the standard deviation found for a fleet of identical vehicles in the field to be 20-30% of the actual emission rate. This means that at least 30 identical randomly selected vehicles must be sampled to ensure that the resulting emissions averages are within 5% of the true average value for this vehicle type to a 90% probability. These estimates were made using the Student T-Test. With the advent of computer-controlled vehicles, it has become possible to change how an engine operates over time. This proved to be a problem with respect to truck emission standards in the U.S. In this case, the vehicles were designed to pass the U.S. EPA emissions test cycle, which lasted several minutes, but would then go into a different more fuel-efficient but more polluting operating mode after some time had passed. This resulted in the trucks passing audits where they were operated over the standard cycle, but they were actually polluting above the standard for most of their real operational time. This type of problem took several years to detect. This issue has resulted in a call for more on-board testing and longer audits to determine emissions under the full actual operating mode of the vehicles. The case where vehicles are tested to help develop emission inventories and clean air plans constitute a final case where sampling procedures are complex. As noted earlier, it is common for identical vehicles to vary considerably in emissions. This problem increases as vehicles age and wear and undergo a variety of fuels and maintenance procedures that may or may not be good relative to the emissions from the vehicle. Thus, it is important that representative samples be selected from the fleet of interest. The desired sample should be a truly random sample selected from the entire vehicle fleet of interest. In typical studies carried out by ISSRC, the standard deviation of emissions other than carbon dioxide turns out to be about 100% of the average emissions reading for both gasoline and diesel vehicles. Thus, in order to have 90% confidence that the results of the emissions study are within 15% of the real average requires a sampling of about 120 vehicles. The same standard deviation applies to subclasses of vehicles meaning that the averages of samples of 15 vehicles out of a subclass can only be expected to a 90% probability to be within 45% of the true average emissions for that subclass of vehicles. Thus, great care has to be taken in order to use emission measurements to establish the true overall fleet emission rates for vehicles or for subclasses of vehicles. In the cases where vehicles are to be tested in a laboratory or on the road, vehicle acquisition becomes a complication that must be addressed. Most people feel that they need their vehicles every day and are thus reluctant to give them up. People can also be suspicious of the purpose of the intended vehicle testing and if it might damage or harm their vehicle. It is true that even with great care that in on-road testing about 1 in 200 vehicles will be scratched or in the case of some modern plastic bumpers, the tube that carries exhaust gases to the flow meter has melted the bumper. Thus, the vehicle tester must be in a position to ensure that any damage to a vehicle is fully repaired. In cases where it is desired to collect start-up emissions, then the vehicles are needed over night. In these cases, a safe storage location must also be arranged for. It has generally been found that it is easiest to have the vehicle owner operate their own vehicle in cases where specific driving cycles are not needed. They are often asked to sign a form that they have adequate liability insurance on the vehicle before the vehicle is allowed into the program. This means that the owner must bring the vehicle to the test site the night before the test and return at a specified time the next day to drive the vehicle during the test. It is also possible to arrange for professional drivers to operate the vehicles during testing. In cases where a specific driving pattern is intended to be driven, a professional driver should be used. Since it is difficult to observe a computer screen and operate a vehicle in a prescribed manner either in the laboratory or on the road. It is further important that the vehicle exhaust system be intact. Holes in the exhaust system will allow exhaust to escape and the flow measurement readings will be in error. Many vehicles have two exhausts. If these two exhausts are cosmetic and one can be stopped up without impeding flow from the engine, then these vehicles can be tested. On the other hand, vehicles with dual independent exhaust systems normally have to be rejected. With these constraints, it is easy to see why it can be difficult to acquire vehicles to be tested. It often takes a monetary payment to get persons to allow their vehicles to be used. In the U.S. it is common to pay $100 U.S. per day in 2007 to get a vehicle for testing. In many developing countries a fee of $50 U.S. per test can be adequate in 2007 to get people to leave their passenger vehicles over night. Trucks and buses, if they are private, can be more expensive and can cost $250 or more per day in 2007 in most developing countries. 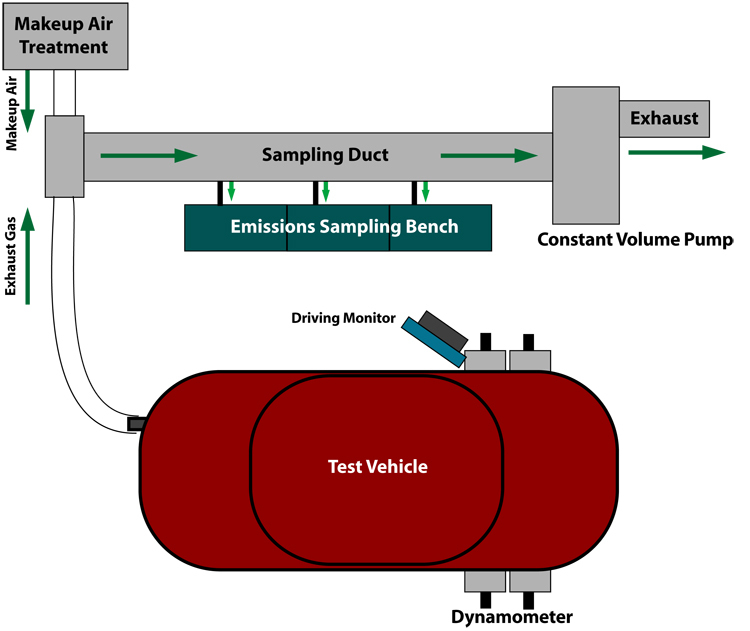 The traditional way to measure emissions from vehicles is to bring them into the laboratory and measure emissions as they are operated on a dynamometer. In the better laboratories, the dynamometers can vary the load that they place on a vehicle on a second by second basis. Some older dynamometers are only capable of maintaining a steady load that can be changed, but only while the vehicle is not being tested. In either case, a load is placed on the vehicle that is equivalent to a load that the vehicle might experience while it is operating on a roadway and the emissions are measured from the vehicle. In the case of dynamic dynamometers, the vehicles can be put through specific driving patterns such as described in table 6.2.9-1. Often, vehicles are expected to meet certain emission requirements while driving a specified driving cycle. The actual emission measurements are typically made using a Constant Volume Sampling (CVS) system. This system works by pulling a constant volume of air that is larger than the amount of gases emitted by the vehicle being tested through a sampling duct. The exhaust gases from the vehicle being tested are mixed with this makeup air. The makeup air must, of course, be free of gases and particulate matter in order to not distort the testing process. Figure 6.2.9-2 illustrates the overall CVS testing process. By pulling a constant volume of air through the sampling duct, two advantages are gained. One, the exhaust gas temperature is reduced so that there are minimal issues with the sampling equipment; two, the reactions of the exhaust gases will be similar to what would have happened in the atmosphere in any case; and three, the calculation of mass emissions is the simple process of multiplying the concentration of gases in the sampling duct times the exhaust volume corrected to standard conditions. The driving monitor illustrated in figure 6.2.9-2 is needed to tell the driver the speed that must be followed second by second. This is typically achieved by providing a line on the monitor that the driver is to follow and a point that indicates the vehicle speed. There are lines on each side of the driving line that tell the driver if the vehicle has gotten too far off of the intended driving curve. The load provided by the dynamometer is designed to place the same load on the vehicle that would have occurred should the vehicle be operating on a normal roadway. Figure 6.2.9-3 shows a CVS systems used on motorcycles and passenger cars in Santiago, Chile. Before the advent of modern emission monitors that can measure concentrations on a second by second basis, the sampled gases were fed into sampling bags at a predetermined rate. The gases were then tested at the end of the driving cycle and the mass of gases calculated based on the concentrations in the bag. In the case of the standard FTP testing illustrated in an earlier section, gases were fed into three bags through the testing procedure. Bag 1 received gases from the first about 500 seconds of the test. Gases were then directed into a second bag for the middle approximately 1500 seconds of the test. And finally, gases were directed into a third bag for the final 500 seconds of the test. The first bag and the third bag included gases from the same driving cycle except that the vehicle was fully warmed up when the gases went into the third bag. This allowed the laboratory to approximate cold start-up emissions by subtracting the emissions calculated from Bag 1 from the emissions in Bag 3. Bag 2 represented the hot running emissions. There are some disadvantages today to the CVS system. With the extremely clean vehicles that are available today, the dilution process reduces the concentrations to be measured to a point that instrumental error can become a problem. Efforts are being made to develop a mini-dilution system that will prevent this from happening. A second problem occurs if the researcher is interested in the exhaust gases before they are mixed with air. This can not be carried out in this system. Finally, the cost of a complete CVS sampling system can be quite high running into several million U.S. dollars for just a system for testing light-duty vehicles. An example of a modern CVS sampling system along with other sampling systems can be found at the Horiba web site at http://www.ats.horiba.com/emission-measurement-systems.html. The testing regulations for the U.S. EPA can be found at http://www.epa.gov/nvfel/testing/regulations.htm. In order to measure emissions on-board a vehicle, several criteria must be met. 1. The concentration measurements of the instrument should be reliable and repeatable (determined through standard equipment calibration procedures). 2. The instrument should have the capability of measuring emissions within the range of the emissions from the vehicle being tested (the noise of the measurement should not exceed the magnitude of the emissions being measured). 3. The instruments must be durable enough to withstand bumps and jolts on-board the vehicle being tested as well as low grade and leaded fuels. 4. The equipment should be able to collect and record data on a second by second basis. 5. There must be provided the capability to measure the driving pattern of the vehicle being tested. 6. The equipment power usage must be within the range that allows a battery to power it for at least 45 minutes. 7. The weight of the equipment should be within a range to allow it to be placed on and removed from the vehicle with reasonable ease. It should also not exceed the weight with a power supply of more than one additional passenger in the case of a passenger vehicle. 8. A means must be provided to determine the exhaust flow rates of the vehicle on a second by second basis. The three most common PEMs meet these criteria for most vehicles. It is important however, to ensure that good zero and span gases are available for use with the analyzers and that the analyzers are calibrated often. With the Sensors equipments, ISSRC found that a full calibration in the morning and evening along with zeroing the unit at each test gives good results. It is also necessary to recalibrate if any filters are changed or if the unit is turned off or otherwise adjusted. In order to capture both start-up and running emissions, tested vehicles must be allowed to soak for at least 12 hours. In this case, the data from the first 200 seconds of driving can be used to approximate start-up emissions. If vehicles are brought to the testing site with the engines warm, then the only valuable data that will be derived is running emissions. In this latter case, it is best to ignore the first 200 seconds of data collected in the test because depending upon the state of warm-up of the vehicle, the first 200 seconds may contain some level of start-up emissions, which could distort the measurements of running emissions. Figure 6.2.9-4 shows the testing process with vehicles waiting to be tested after sitting all night, a vehicle being pushed to the equipment installation location to keep engine and catalyst cold, and a passenger vehicle and truck ready to be tested with all equipment installed. 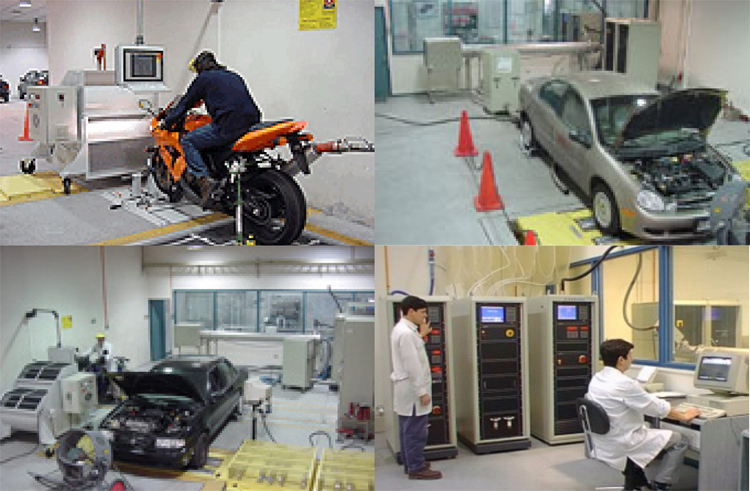 The equipment being used in the pictured tests are manufactured by Sensors, Inc. The gasoline testing unit does not require a heated line so that the power requirements can be supplied by a single 100 amp-hour lead acid battery, which can be purchased almost anywhere in the world. A second backup battery is normally necessary since over the day, the battery will lose charge and must be exchanged in order to recharge the used battery. The diesel testing requires a heated line. 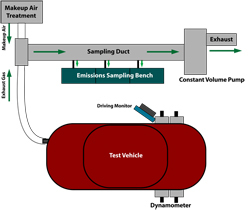 Particulate measurements are also being made in the truck test shown in figure 6.2.9-4 using a Dekati DMM particulate analyzer, which requires a relatively high volume, high vacuum pump as well. This added equipment requires the use of a 2500watt or larger generator to supply the needed power during testing. In the case of passenger vehicle testing, test equipment weight is an issue. The Sensor Semtech-G test unit weighs about 39 kilograms, the lead acid battery weighs about 28 kilograms, and the exhaust measurement system weighs about 5 kilograms for a total of 72 kilograms. This is the weight of a typical person. Thus, the equipment adds the weight of one person to the weight being moved by the vehicle. This is the equivalent to about 6% of the weight of a vehicle and thus slightly increases the engine load. However, since it is common to have more than one person in a vehicle, this added weight is normally ignored. In the case of testing trucks and buses it is desired to have them include the weight similar to a normal cargo or, in the case of a bus, to carry the normal passenger load. Thus, the weight of the equipment even with the generator is inadequate to represent the normal weight in a vehicle. To remedy this, sand or water is commonly used to add weight to trucks and buses. Sand bags are located under the red tarp on the truck in figure 6.2.9-4. It is important to properly select routes during on-road testing. If the purpose of the test is to compare control equipment or vehicle emissions then the use of a fixed driving pattern can be useful. To operate an on-road vehicle in a predefined operating pattern, special equipment must be obtained to show the driver when to accelerate and when to slow down. The Semtech-G comes with this capability. The Institute for Technical Research (IPT) in Brazil set up their own laptop computer and optical speed sensor to allow a driver to drive specific driving patterns, which worked very well in a joint study with ISSRC. In most on-road testing, predefined driving patterns are not desired and not necessary. There are typically two potential goals for the testing. One goal can be to establish an emission rate to be used in estimating local emissions for air quality management purposes. In this case, it is necessary to operate the vehicle on typical roads that encounter typical driving speeds and congestion for the overall location of interest. A driving route needs to be laid out where the vehicle can leave the equipment installation location and return to the equipment installation location often in less than an hour under any and all traffic conditions while covering the needed routes. A second goal is to establish base emission rates for research or model development purposes. In this case, it is valuable to cover the entire spectrum of speeds, accelerations, decelerations, and cruise conditions (Younglove, Scora, & Barth, 2005). This full range of testing conditions is necessary if accurate estimates of emissions are to be obtained during high power events, even if in reality these events are rare. In urban, congested areas it can be challenging, although not impossible, to achieve the higher speed and acceleration events during testing. In the situation where it is desired to drive specific predefined driving patterns, then lightly driven roadways need to be found so that the vehicle being tested can be operated freely to match the desired driving pattern. This problem was addressed in a series of studies in Los Angeles by finding sections of remote roadways that were lightly traveled and then using these roads to drive standard driving cycles. A lightly used freeway in the eastern part of the city was used during mid-day and late evening to attempt specific driving patterns, which worked well, once the local policing authorities understood what was going on. In Sao Paulo, a two-lane roadway through a park where traffic was normally limited was used, with permission, over several days to test buses. In both cases the results were successful and comparisons of consecutive measurements on the same vehicles using the same driving patterns produced carbon dioxide results in Sao Paulo within 2% of one another indicating that the driving cycle was being repeated accurately since concentration measurement and flow measurement error can contribute much of the 2% deviation. In the situation where it is desired to simply operate the vehicles on representative roads to provide emission rates for vehicles as they are normally operated, a driving route is then laid out that will take the vehicle from the test preparation site out into the field and return in a designated timeframe. Again, the overall objective for collecting emissions data would be to obtain measurements under all driving speeds during the test. Normally, a route is selected that will take from 20 minutes to 45 minutes to complete and includes portions of residential, arterials, and highways as to capture as much of the variation in speeds and accelerations and steady state driving as possible. Of course, the route time will vary as traffic varies throughout the day. The average emissions from this type of study should provide some indication of the likely overall fleet emissions rate if the vehicles are randomly selected and the roadways selected are typical of those found in the area being studied. As noted in the sampling discussion, at least 120 vehicles need to be sampled in order to provide adequately accurate results. Of course, more vehicles would be better. It is difficult for experienced testers to install and calibrate equipment on gasoline vehicles in less than 45 minutes. When normal equipment problems are factored in, one hour per gasoline vehicle must be allowed for experienced persons. Sampling 10 vehicles per day will require 12 days of testing to get 120 vehicles. 1. Determine 10 or more VSP ranges (bins) to divide the emissions data into. In the case of studies carried out by ISSRC, the 60 VSP/Stress bins have been used, but it is possible to get reasonable results with fewer bins. 2. Determine the average emissions that occurred when the tested vehicle operated within each of the defined bins. There will be little data in some of the bins because most urban driving is confined to -17 to 15 kilowatt per ton power demands. 3. Select a driving cycle to normalize the data to. Divide the VSP demand on the vehicle operating in the selected driving cycle into the fraction of driving that will occur in each of the bins defined in Step 1 of the process. 4. Multiply the fraction of driving determined in Step 3 by the average emissions per bin in Step 2 and sum over all of the bins to produce an approximation of what the vehicle would have emitted had it been driven in the driving cycle selected in Step 3. While the above-described process is not perfect, averaged over several vehicles it has been found to produce reasonable results. For example, based on roadway tests carried out using specific driving patterns in Sao Paulo, Brazil by ISSRC, it was possible to use the normalization process described above to predict emissions that should occur. This was then compared to the actual measured emissions. On average the normalization process gave results that averaged about 4% different from the actual measured results. 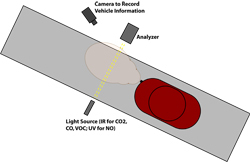 Remote testing of vehicles offers another useful option for measuring vehicle emissions. The positive attributes of remote sensing for vehicle testing is that there are no vehicle acquisition difficulties and many hundreds or thousands of vehicles can be tested in a short timeframe. The negatives are that the emission measurements are less precise especially for the measurement of mass emissions and the range of emissions under different vehicle power demands that can be measured are limited. The most common remote testing involves placing a beam across a lane of road and looking at the absorption spectrum from the exhaust. Figure 6.2.9-6 illustrates a basic remote sensing setup. The roadway can be a freeway on-ramp or almost any type of street where a single lane can be isolated. The concentration of CO, VOC, NOx, and CO2 in the exhaust can be estimated based on the concentration data that is collected from the vehicle exhaust plume. 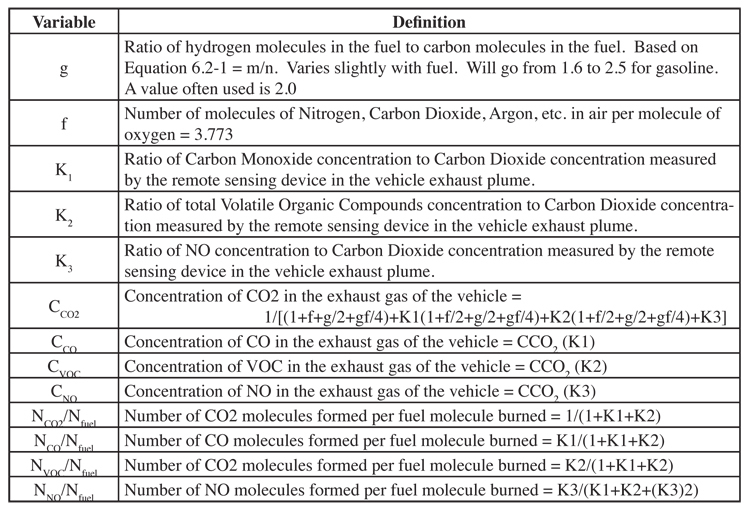 Referring to equation 6.2.9-7 (as seen in a previous section), a number of equations can be derived based on the concentration of gases measured in the vehicle exhaust plume. These are shown in table 6.2.9-8. 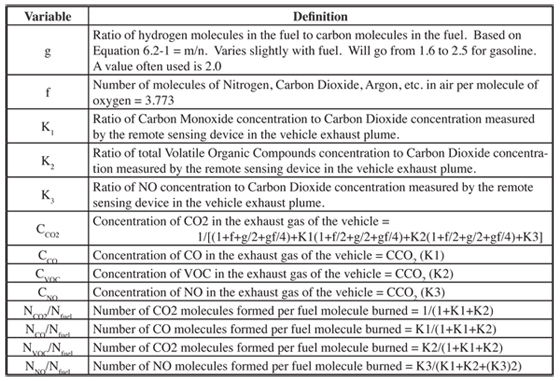 As can be seen from table 6.2.9-8, the concentrations in the vehicle tailpipe can be estimated along with the number of molecules of the various pollutants per fuel molecule can also be determined. These latter numbers can be turned into emissions per liter of fuel burned. Since the fuel use rate varies with power demand on the vehicle and with vehicle size and engine technology, this is not an easy estimate to make, but understanding the location of testing (such as an on-ramp to a highway), using radar or other remote speed measurement devices to measure the acceleration, and collecting pictures of the license plates to determine engine size and make can help to increase the understanding of a vehicle specific amount of fuel being used. Thus, if the fuel use rate of the vehicle is known, then a fuel-based mass emission rate of the vehicle can be established (ie. Grams pollutant/kilometer driven). Since in some ways the remote sensing is a simpler approach for estimating an inventory, many areas are now conducting measurement programs around the world. However, these measurements are still regarded as very approximate and require testing of millions of vehicles at various locations to achieve adequate resolution. One other challenge of this approach at developing inventories is that the amount and spatial distribution of fuel use in an area is then needed to determine overall emissions inventories. This can be difficult, especially if fuel is used for other purposes than on-road travel. The other limitation of using these remote sensing fuel based inventories is that there is no means of projecting future year emissions, which is a major function of many vehicle emissions models. For these reasons, the remote sensing fuel based emissions inventory approach is considered an ‘alternative’ method from the mainstream gram/distance emission rate model (National Research Council, 2000, p. 177). Other reasons besides creating an entire inventory exist for conducting remote sensing. These include identifying high emitters in the fleet and improving the understanding and impact of inspection and maintenance programs. Remote sensing is also a useful method for providing an independent validation (although approximate) of the conventional models such as MOBILE. Remote sensing studies currently aid in both of these contexts in the US. The California Air Resources Board sponsored a study to look at the accuracy of these remote sensing devices for estimating the concentrations of pollutants in the vehicle exhaust. They found that CO concentrations could be estimated within 5% and VOC concentrations could be estimated within 15% (Steadman, 1994). Remote sensing has been used primarily in the United States to identify the numbers of high emitting vehicles based on exhaust gas concentrations for general characterization of the fleet. It has not been perceived as a tool to establish actual mass emission rates. Inspection and Maintenance, as an emissions reduction tool, are discussed in Chapter 8 of this handbook. The purpose of this section is to discuss some of the regulatory and operational considerations that should be addressed with respect to the emission measurements that go along with an I/M program. 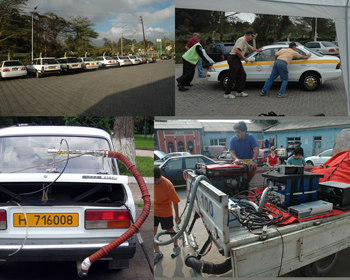 I/M programs are intended to find high emitting vehicles and to get those vehicles repaired to lower their emissions. A key component in this process is the emission testing system. In most I/M programs, only the concentrations of gases are measured. The emission measurement systems do not record the mass of emissions coming from the vehicle. In this case, there is no need to monitor the total flow of gases from the vehicle. In a sense one might consider the measurements in an I/M program to be similar to taking the temperature of a human patient. The measurements do not tell the examiner what is wrong or how bad the problem is; they simply inform the examiner that there is something wrong that should be fixed. For this reason, emission limits in I/M programs are typically set relatively high. The purpose is to set emission levels appropriately to identify the highest emitting 10-40% of the population. I/M programs often involve a dynamometer to put a load on the vehicle. This is particularly necessary for NOx measurements since non-dynamometer tests do not produce effective testing for NOx. The types of dynamometers that are used are typically the simpler types that place a fixed load on the vehicle. The vehicle is then driven up to a predetermined speed, or in some cases, more than one predetermined speed and the exhaust concentrations of relevant gases are measured. Even in cases where there is no dynamometer, the vehicle is operated typically at more than one engine rpm and the emission results recorded. It is typical to record carbon monoxide, volatile organic compounds, nitrogen oxides, carbon dioxide, and sometimes oxygen. The measurement of carbon dioxide and/or oxygen signals the reviewer to know if the sample is actually exhaust gas or if regular air is being leaked into the system. If a dynamometer is used, the I/M program is typically labeled as a loaded I/M test. If a dynamometer is not used the test is typically labeled as an unloaded I/M test. Regardless of the type of test, it is important that the exhaust sample be collected over a long enough period that the actual exhaust emissions reach the analyzer for measurement. This can take from a few seconds to more than a minute depending upon the distance from the vehicle exhaust to the analyzers. Care should be taken to ensure that the sampling time is adequate for each phase of the test. The accuracy of the instrument is also important. Zero and span gases are often required in order to audit the readings of the emissions testing analyzer. The instrument audits with zero and span gases can involve more than one span gas. Normally, no more than three span gases are used, and it is common with today’s instruments to use only a zero and single span gas. In this latter case, the span gas should be selected to have gaseous concentrations that are about 2/3 of the instruments normal testing range. Because I/M programs are amenable to cheating, precautions need to be taken in the emissions measurement process to ensure that true and valid emission measurements are being made. Experience in the U.S. has shown that most cheating in I/M programs come from the testing facility taking bribes to pass vehicles; although, there have been some cases where vehicles are purposely failed in order to extract money from the vehicle owner during the repair process. 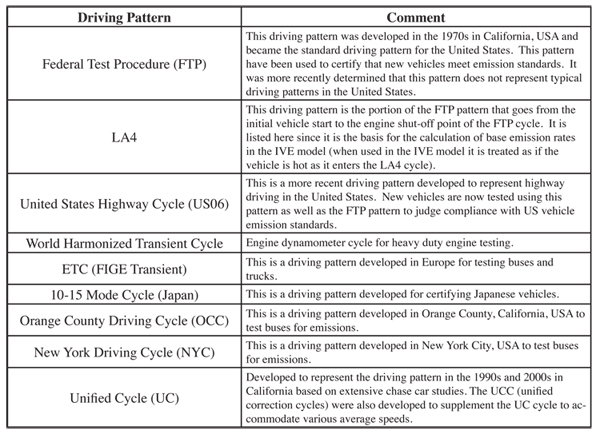 These issues are discussed more fully in Chapter 8; however, it should be noted that in the California, USA I/M program that the analyzers record and save or transmit the exhaust emissions data to the government agency that oversees the program. This allows checks on the readings being reported by a testing facility. Of course, this does not prevent the testing facility from testing a vehicle that will pass the test and then certifying a different vehicle. This latter problem is addressed by undercover vehicles that go to testing facilities with passing and failing vehicles to see what happens at the facility.